A nice catch ! Chip, where are you ? Long, bright green grass. Link, where are you ? I love it, my favorite part is you get to choose to be a boy or girl! 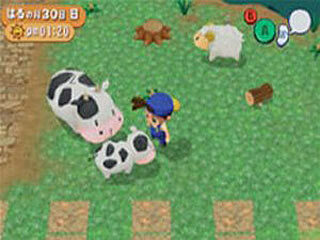 I hated that you didn't start out with a cow though, other than that this game is magical. This game was awesome! I plan on marrying Eve. When I play as a girl, I'm gonna marry Joe. 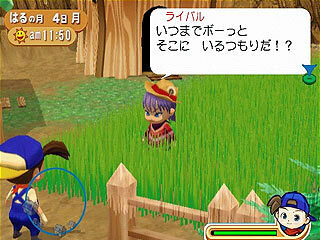 I haven't played it yet but I have a lot of Harvest Moon games and I think this one is gonna be pretty cool. It looks like it is a really good one. I definitely plan on buying it when it comes out! They are so cute, I'm sure that I buy it. And you can play also female. I WANT IT NOW!! I know, I love Harvest Moon game series, but.. Well, that guy, and 'barbie doll' are kinda short, so they look like they're 3yrs / 5yrs old.. So, if Id get this game, I would have problems getting used to the size. But, till now every last Harvest Moon, none has been a dissapointment, so I think this will be good also. I also LOVE the characters! My friend asked which girl I remind the most, I said Katie, so I'll marry her. ^^ But, good work. It looks like it's gonna be one of those Harvest Moon games where it may take some time to get used to things and controls, but in the end this game is gonna rock. Yeah I GOTTA get this game! I can't wait! 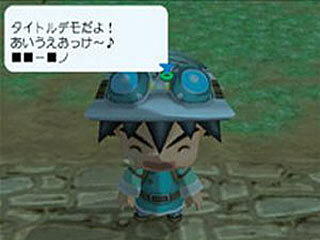 The character design resembles Wind Waker quite a bit. Small ankles, with tight fitting clothes. Huge heads, but pot bellies. Not only that, but it is also cell-shaded. Interesting Natsume, interesting. Anyway... looks better than that horrible Wonderful Life game, so I won't complain. The game looks interesting, I'll check it out if I can get it for $30. 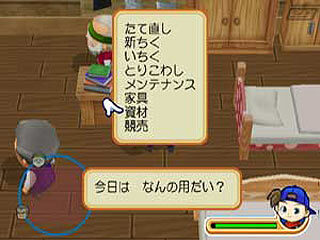 I'm guessing that is a stamina meter at the bottom right. The radar will be very useful, finding stuff won't be such a hassle anymore. Well anyway, overall I think the game has kind of a...odd look, but in the end it seems like it should at least be better than Wonderful Life. 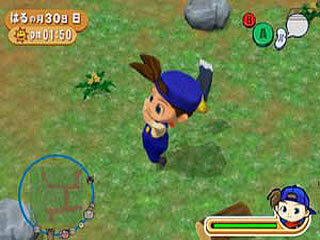 The game looks great I can't wait till it comes to my town so I can buy it. :D Can you please give some more pictures of the game and maybe even the town or something like that, so I can see more of what the game is like. Please. It will be awesome. I am saving up for it now. I can't wait. Pig as a pet will be cool. Do you guys think you could get more pics with the pig in it? Sorry but this game seems boring. 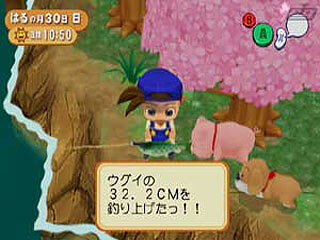 Catch fish and talk to cow, for me this is not fun. Best game yet!! 5 stars!!! In 1 out of 10, I give it a ten. I have seen tons of sites on this, it looks and sounds awesome, the only maybe downside is the Animal Crossing graphics other than that, perfect!! I thought it was a cool game.... not! Isn't it for young children of 6 years old?? A Wonderfull Life is much better!! This one looks way better than A Wonderful Life, I like those graphics and I like the way the animals look like they're from Friends of Mineral Town. This game is gonna be gangsta, I also like that there are more people you can marry and you can move your furniture unlike AWL. I can't wait for it to come out! The adorable chibi setting makes for a charming and fresh feel, while the object of the game presents a challenge unlike many of the others (although they still rock). 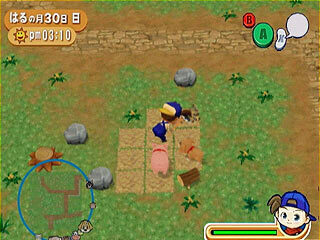 This game loks better than A Wonderful Life because of all the new animal choices, farming land, WIVES/HUSBANDS(! 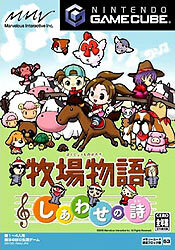 ), rivalry (as opposed to do what you want in a retarded manner), house plot choices, lighter and more chibi graphics (i love that), and now there's music played through the whole town -- instead of just at your farm -- it'll bring back a Back to Nature feeling.